A spreader with a capacity of 100 lbs. It has a rugged all steel hopper. 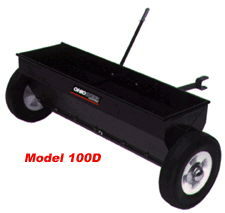 Size of the spreader is 9 5/8" x 36" x 10" and weighs 42 lbs. * Please call us with any questions about our spreader towable drop in Mason OH, Westchester OH and Cincinnati metro area.